David Malo : Surfriding, 1840. 1525 Bernice Street, Honolulu, Hawaii, 2005. Originally writen in native Hawaiian circa 1835-1840. Translated from the Hawaiian by Nathaniel B. Emerson, circa 1889. This account of traditional Hawai'ian surf riding, the earliest by a native observer, is not without several difficulties. Malo identifies surf riding as "a national sport of the Hawaiians," and immediately refers to its association with gambling and describes, rather unclearly, the format of a surfing competition. The translator, Nathaniel B. Emerson (circa 1889), notes that interpreting the account of the surfing contest was problematic. "his affections were so entirely turned against the whole (Kapu) system, not only of idol-worship, but all the entertainments of song, dance and sport as well, that his judgment seems often to be warped." As such, the reliability of this passage is questionable. Unfortunately, Malo's estimation of surf board length, occassionally in excess of "four fathoms" or 24 feet (1 fathom = 6 feet), begs credibility. In the footnotes, W.D Alexander (1903) was "inclined to doubt the accuracy" of Malo's statement, and Tom Blake (1935) expressed similar reservations and suggested an alternative calculation, "I believe Malo meant yards when he used fathoms." That would suggest a maximun board length at, a relatively conservative, 13 feet. Malo can be said to accurately report that there were two different surfboard designs. The first were "broad and flat," later identified by I'li (1870) as the alaia, and "generally hewn out of koa." The second, "a narrower board," later identified by I'li as the "thick" olo, "was made from 'Wili'Wili. Ellis (1825) had also previously identified two surfboard designs, both "5 to 6 feet." Some were "flat," but most were "slightly convex on both sides." Willi willi as a timber used to build surfboards, and their Hawaiian name, papa he'e nalu. The account of canoe construction, in chapter 24, is particularly significant. In 1896, the authors (collectively refered to as Thrum) of an article titled Hawaiian Surfriding appropriated much of this material as an account of ancient surfboard construction. While there were some parallels, there are considerable differences highlighted by several inconsistancies in Thrum's report. CHAPTER 48 SURF RIDING, HEE-NALU Page 223. 2. When the bets were all put up, the surf riders, taking their boards with them, swam out through the surf till they had reached the waters outside of the surf. 4. The surf riders having reached the belt of water outside of the surf, the region where the rollers began to make head, awaited the incoming of a wave, in preparation for which they got their boards under way by paddling with their hands until such time as the swelling wave began to lift and urge them forward. Then they speeded for the shore until they came opposite to where was moored a buoy which was called a PUG. 5. If the combatants passed the line of this buoy together, it was a dead heat; but if one went by it in advance of the other, he was the victor. 1. Sect. 1. Surf riding was one of the most exciting and noble sports known to the Hawaiians, practiced equally by king, chief and commoner. It is still to some extent engaged in, though not as formerly, when it was not uncommon for a whole community, including both sexes and all ages, to sport and frolic in the ocean the livelong day. While the usual attitude was that of reclining on the board face down-wards with one or both arms folded and supporting the chest, such dexterity was attained by some that they could maintain their balance while sitting or even while standing erect as the board was borne along at the full speed of the inrolling breaker. Photographs can be given in proof of this statement. 2. Sect. 2. Koa was wood of which the canoe was generally made. 3. Sect. 2. Wili-wili is a light, cork-like wood, used in making floats for the out-riggers of canoe, for nets, and a variety of other similar purposes. 4. Sect. 3. The longest surf board at the Bishop Museum is sixteen feet in length. It was quite sufficient if the board was of the length of the one who used it. ... four, or even more, fathoms in length. If any thinks it an easy matter to ride the surf on a board, a short trial will perhaps undeceive him. 5. Sect. 6. I am unable to give a satisfactory translation of this section. ..A i ka au hou ana i ka mea i komo i ka pu-a i ho-o mawaena mai oia aole e hiki i ke kulana 0 ka eo ia nana. 1. The Hawaiian woo, or canoe, was made of the wood of the koa tree. From the earliest times, the wood of the bread-fruit, kukui, ohia-ha, and wiliwili was used in canoe-making, but the extent to which these woods were used for this purpose was very limited. The principal wood used in canoe-making was always the koa (Acacia heterophylla). 2. The building of a canoe was an affair of religion. When a man found a fine koa tree he went to the kahuna kalai woo and said, "I have found a koa tree, a fine large tree." On receiving this information, the kahuna went at night to the mua (1) to sleep before his shrine, in order to obtain a revelation from his deity in a dream as to whether the tree was sound or rotten. 3. And if in his sleep that night he had a vision of some one standing naked before him, a man without a malo or a woman without a pa-u, and covering their shame with the hand, on awakening the kahuna knew that the koa in question was rotten (puha), and he would not go up into the woods to cut that tree. ... man or woman standing before him when he awoke, he felt sure that the tree would make a good canoe. 5. Preparations were made accordingly to go into the mountains and hew the koa into a canoe. They took with them, as offerings, a pig, cocoanuts, red fish (kumu), and awa. Having come to the place they camped down for the night, sacrificing these things to the gods with incantations, (hoomana) and prayers, and there they slept. 6. In the morning they baked the hog in an oven made close to the root of the koa, and after eating the same they examined the tree. One of the party climbed up into the tree to measure the part suitable for the hollow of the canoe, where should be the bottom, what the total length of the craft. "0 Ku-pulupulu, (2) Ku-ala-na-wao, (3) Ku-moku-halii, (4) Ku-ka-ieie, (5) Ku-palalake,(6) Ku-ka-ohia-laka. (7)"
These were the male deities. "0 Lea (8) and Ka-pua-o-alakai, (9) listen now to the ax. This is the ax that is to fell the tree for the canoe. ..."
8. The koa tree was then cut down, and they set about it in the following manner: Two scarfs were made about three feet apart, one above and one below, and when they had been deepened, the chips were split off in a direction lengthwise of the tree. 9. Cutting in this way, if there was but one kahuna, it would take many days to fell the tree; but if there were many kahuna, they might fell it the same day. When the tree began to crack to its fall, they lowered their voices and allowed no one to make a disturbance. 10. When the tree had fallen, the head kahuna mounted upon the trunk, ax in hand, facing the stump, his back being turned toward the top of the tree. Thereupon the kahuna's wife handed him his ceremonial malo, which was white; and, having girded himself, he turned about and faced the head of the tree. Then he struck a blow with the ax on the tree, and repeated the same words again; and so he kept on doing until he had reached the point where the head of the tree was to be cut off. 13. At the place where the head of the tree was to be severed from the trunk he wreathed the tree with ieie (Freycinet-ia scandens). Then having repeated a prayer appropriate to cutting off the top of the tree, and having again commanded silence and secured it, he proceeded to cut off the top of the tree. This done, the kahuna declared the ceremony performed, the tabu removed; thereupon the people raised a shout at the successful performance of the ceremony, and the removal of all tabu and restraint in view of its completion. 14. Now began the work of hewing out the canoe, the first thing being to taper the tree at each end, that the canoe might be sharp at stem and stern. Then the sides and bottom (kua-moo) were hewn down and the top was flattened (hola). The inner parts of the canoe were then planned and located by measurement. 15. The kahuna alone planned out and made the measurements for the inner parts of the canoe. 16. Then the inside of the canoe was outlined and the pepeiac, brackets on which to rest the seats, were blocked out, and the craft was still further hewn into shape. A makuu (12) or neck, was wrought at the stern of the canoe, to which the lines for hauling the canoe were to be attached. 17. When the time had come for hauling the canoe down to the ocean, again came the kahuna, to perform the ceremony called pu i ka woo, which consisted in attaching the hauling lines to the canoe log. "0 Ku-pulupulu, Ku-ala-na-wao, and Ku-moku-halii! look you after this canoe. Guard it from stem to stern until it is placed in the halau." After this manner did they pray. 18. The people now put themselves in position to haul the canoe. The only person who went to the rear of the canoe was the kahuna, his station being about ten fathoms behind it. The whole multitude of the people went ahead, behind the kahuna no one was permitted to go; that place was tabu, strictly reserved for the god of the kahuna kalai woo. Great care had to be taken in hauling the canoe. Where the country was precipitous and the canoe would tend to rush down violently, some of the men must hold it back lest it be broken; and when it got lodged some of them must clear it. This care had to be kept up until the canoe had reached the halau, or canoe house. 21. In the halau, the fashioning of the canoe was resumed. First the upper part was shaped and the gunwales were shaved down; then the sides of the canoe from the gunwales down were put into shape. After this the mouth (waha) of the canoe was turned downwards, and the iwi kaele (bottom), being exposed, was hewn into shape. This done, the canoe was again placed mouth up and was hollowed out still further (kupele maloko). The outside was then finished and rubbed smooth (ana.i ia). Then the inside of the canoe was finished off by means of the koi-owili, or reversible adz (commonly known as the kupa-ai kee). 22. After that were fitted on the carved pieces (na laau) made of ahakea or some other wood. The rails, which were fitted on to the gunwales and which were called moo (lizards), were the first to be fitted and sewted fast with sinnet or ah'a. The carved pieces, called '1nanu, at bow and stern, were the next to be fitted and sewed on, and this work completed the putting together of the body of the canoe (ke kapili ana 0 ka waa). It was for the owner to say whether he would have a single or double canoe. 23. If it was a single canoe (kaukahi) , cross-pieces (iako) and a float (ama) were made and attached to the canoe to form the outrigger. The ceremony of lolo-u'aa, consecrating the canoe, was the next thing to be performed in which the deity was again approached with prayer. This was done after the canoe had returned from an excursion out to sea. 24. The canoe was then carried into the halau, where were lying the pig, the red fish, and the cocoanuts that constituted the offering spread out before the kahuna. The kahuna kalai was then faced towards the bows of the canoe, where stood its owner, and said, "Attend now to the consecration of the canoe (lolo ana 0 ka waa) and observe whether it be well or ill done." That ax also is a kuwa. This is the ax of our venerable ancestral dame. Dame Papa, the wife of Wakea. She lifted the tabu from it. Gone is the tabu from the canoe of Wakea. 26. The canoe this of our ancestral dame. Dame Lea, wife of Moku-halii. Lifted was the tabu from the canoe of Wakea. The tabu is lifted, removed. 27 -28. When the kahuna had finished his prayer he asked of the owner of the canoe, "How is this service, this service of ours?" Because if anyone had made a disturbance or noise, or intruded upon the place, the ceremony had been marred and the owner of the canoe accordingly would then have to report the ceremony to be imperfect. And the priest would then warn the owner of the canoe, saying, "Don't you go in this canoe lest you meet with a fatal accident." 29. If, however, no one had made a disturbance or intruded himself while they had been performing the lolo (17) ceremony, the owner of the canoe would report "our spell is good" and the kahuna would then say, "You will go in this canoe with safety, because the spell is good" (maikai ka 1010 ana). 30. If the canoe was to be rigged as part of a double canoe the ceremony and incantations to be performed by the kahuna were different. In the double canoe the iako used in ancient times were straight sticks. ...continued to be the case until the time of Keawe, (18) when one Kanuha invented the curved iako and erected the upright posts of the para. #13. Sect. 21. This Hawaiian paint had almost the quality of a lacquer. ... of the kukui tree, the juice of the bud of the banana tree, together with charcoal made from the leaf of the pandanus. A dressing of oil from the nut of the kukui was finally added to give a finish. I can vouch for it as an excellent covering for wood. 4. The koa (2) was the tree that grew to be of the largest size in all the islands. It was made into canoes, surf-boards, paddles, spears, and (in modern times) into boards and shingles for houses. The koa is a tree of many uses. It has a seed and its leaf is crescent-shaped. 5. The ahakea (3) is a tree of smaller size than the koa. It is valued in canoe-making, the fabrication of poi boards, paddles, and for many other uses. 12. The wili-wili is a very buoyant wood, for which reason it is largely used in making surf boards (papa-hee-tlalu), and outrigger floats (anuz) for canoes. 13. The ulu or breadfruit is a tree whose wood is much used in the construction of the doors of houses and the bodies of canoes. 13. The following practices were considered hewa (wrong conduct) by the landlord, that one should gjve himself up to the fascinations of sport and squander his property in puhenehene, sliding the stick (pahee), bowling the ulu- maika, racing with the canoe, on the surfboard or on the holua sled, that one should build a large house, have a woman of great beauty for his wife, sport a fine tapa, or gird one's self with a fine malo. All of these things were regarded as showing pride, and were considered valid reasons for depriving a man of his lands, because such practices were tantamount to secreting wealth. Canoes are rated very highly after religious decorations or artifacts, points 7 and 8, pages 77 and 78. 27. A great variety of articles were manufactured by different persons which were esteemed wealth. Malo was the son of Aoao and his wife Heone, and was born at the seaside town of Keauhou, North Kona Hawaii, not many miles distant from the historic bay of Kealakekua, where Captain Cook, only a few years before, had come to his death. The exact year of his birth cannot be fixed, but it was about 1793, the period of Vancouver's second visit to the islands. Such good use did Malo make of his opportunties (at the Royal court) that he came to be universally regarded as the great authority and repository of Hawaiian lore. As a natural result of his proficiency in these matters, Malo came to be in great demand as a raconteur of the old-time traditions, mele, and genealogies, as a master in the arrangement of the hula, as well as of the nobler sports of the Hawaiian arena, a person of no little importance about court. In after years, when his mind had been impregnated with the vivifying influence of the new faith from across the ocean (Christianity), his affections were so entirely turned against the whole system, not only of idol-worship, but all the entertainments of song, dance and sport as well, that his judgment seems often to be warped, causing him to confound together the evil and the good, the innocent and the guilty, the harmless and the depraved in one sweeping condemnation, thus constraining him to put under the ban of his reprobation things which a more enlightened judgment would have tolerated or even taken innocent pleasure in, or to cover with the veil of contemptuous silence matters, which, if preserved, would now be of inestimable value and interest to the ethnologist, the historian and the scholar. sionary in that place in the year 1823, at the invitation of the queen- mother, Keopuolani. Under the teachings of this warm-hearted leader of men, to whom he formed an attachment that lasted through life, he was converted to Christianity, and on his reception into the church was given the baptismal name of David. There seems to have been in Mr. Richards' strong and attractive personality just that mental and moral stimulus which Malo needed in order to bring out his own strength and develop the best elements of his nature. From his first contact with the new light and knowledge of Christian civilization, David Malo was fired with an enthusiasm for the acquisition of all the benefits it had to confer. He made efforts to acquire the English language, but met with no great success: his talents did not lie in that direction; one writer ascribes his failure to the rigidity of his vocal organs. His mental activity, which was naturally of the strenuous sort, under the influence of his new environment seemed now to be brought to a white heat. In his search for information he became an eager reader of books; every printed thing that was struck off at the newly established mission press at Honolulu, or afterwards at Lahainaluna, was eagerly sought after and devoured by his hungry and thirsty soul. He accumulated a library which is said to have included all the books published in his own language. In taking account of David Malo's acquirements as well as his mental range and activity of thought, it is necessary to remember that the output of the Hawaiian press in those days, though not productive of the newspaper, was far richer in works of thought and those of an educational and informational value than at the present time. It was pre-eminently the time in the history of the American Protestant Mission to Hawaii when its intellectual force was being directed to the production of a body of literature that should include not only the textbooks of primary and general education, but should also give access to a portion of the field of general information. It was also the time when the scholars of the Mission, aided by visiting friends from the South, were diligently engaged in the heavy task of translating the Bible into the Hawaiian vernacular, the completed result of which by itself formed a body of literature, which for elevation and excellence of style formed a standard and model of written language worthy to rank with the best. entered as one of the first pupils, being at the time about thirty-eiglrt year! ; of age, and there he remained for several years, pursuing the variou! ; branches of study with great assiduity. While at Lahaina David Malo also occupied for a time the position of school-agent, a post of some responsibility and in which one could usefully exercise an unlimited amount of common sense and business tact; there also was the chief scene of his labors for the preservation in literary form of the history and antiquities of his people. Second, the work, a translation of which is here presented, which is also entitled 'Moolelo Hawaii', though it contains many things which do not properly belong to history. The his- torical part brings us down only to the times of Umi, the son of Liloa. Introduction : W. D. ALEXANDER. The trustees of the Bernice Pauahi [Bishop] Museum, by publishing Dr. N. B. Emerson's translation of David Malo's Hawaiian Antiquities, are rendering an important service to all Polynesian scholars. It will form a valuable contribution not only to Hawaiian archaeology, but also to Polynesian ethnology in general. It is extremely difficult at this late day to obtain any reliable information in regard to the primitive condition of any branch of the Polynesian race. It rarely happens in any part of the world that an alien can succeed in winning the confidence and gaining an insight into the actual thoughts and feelings of a people separated from himself by profound differences of race, environment and education. But here another difficulty arises from the rapidity of the changes which are taking place throughout the Pacific Ocean, and from the inevitable mingling of old and new, which discredits much of the testimony of natives born and educated under the new regime. In the following work, however, we have the testimony of one who was born and grew up to manhood under the tabu system, who had himself been a devout worshipper of the old gods, who had been brought up at the royal court, and who was considered by his countrymen as an authority on the subjects on which he afterwards wrote. His statements are confinned in many particulars by those of John Ii of Kekuanaoa, of the elder Kamakau of Kaawaloa, and of the historian, S. M. Kamakau, the latter of whom, however, did not always keep his versions of the ancient traditions free from foreign admixture. Although David Malo evidently needed judicious advice as to his choice and treatment of subjects, some important topics having been omitted, and although his work is unfinished, yet it contains materials of great value for the "noblest study of mankind." Its value is very much enhanced by the learned notes and appendices with which Dr. Emerson has enriched it. The following statement may serve to clear away some misapprehensions. (The first "Moolelo Hawaii" (i. e., Hawaiian History), was writ-) ten at Lahainaluna about 1835-36 by some of the older students, among whom was David Malo, then 42 years of age. They formed what may be called the first Hawaiian Historical Society. The work was revised by Rev. Sheldon Dibble, and was published at Lahainaluna in 1838. A translation of it into English by Rev. R. Tinker was published in the H awaiian Spectator in 1839. It has also been translated into French by M. Jules Remy, and was published in Paris in 1862. 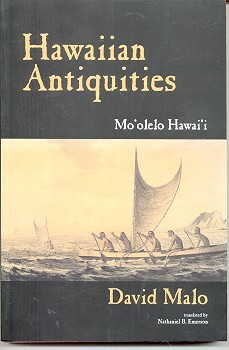 The second edition of the Moolelo Hawaii, which appeared in 1858, was compiled by Rev. J. F. Pogue, who added to the first edition extensive extracts from the manuscript of the present work, which was then the property of Rev. Lorrin Andrews, for whom it had been written, probably about 1840. David Malo's Life of Kamehameha I, which is mentioned by Dr. Emerson in his life of Malo, must have been written before that time, as it passed through the hands of Rev. W. Richards and of Nahienaena, who died December 30, 1836. Its disappearance is much to be deplored. The translation of Malo's manuscript and his notes were purchased from Dr. Emerson in 1898 for $1000.00. According to the minutes of the Trustees' meeting of May 13, 1898, the notes are "critical and explanatory" and "include quotations from meles and pules and old myths, also new material such as had seemed necessary to him to carry out Malo's plans." Dr. Emerson offered to read proof and see the book through press, but at the December meeting, 1898, it was suggested that as Emerson was not a scientist it would be ,weIl for the Museum to edit the manuscript. The services of W. D. Alexander were suggested, hence the introduction by Mr. Alexander and his occasional notes throughout the book. It is not clear just how much Alexander did. For that matter, it is hard to tell where Malo leaves off and Emerson takes over, or how much of the parenthetical material in the actual text is Emerson's. "Hawaiian antiquities," which was first published in 1903, has long been considered a classic because it was written by a Hawaiian scholar whose early background was old Hawaiian, whose later life was in- fluenced by missionary teaching and beliefs. It has been out of print for many years, during which the Museum has received innumerable inquiries as regards a second edition. Now, though the Trustees have long felt it advisable to spend the Museum's limited printing fund on original manuscripts rather than on the reprinting of old material, the demands of the public and of anthropology students have prompted them to approve a second edition. At first, as an economy measure, it was planned to make an offset reproduction of the original, but through the generosity of the Honolulu Star-Bulletin we have been able to reproduce the book by letter press at no greater cost than that of the planographic method. Geoff Cater (2006) : David Malo : Hawaiian Surfriding and Canoes, 1838.